Createx Airbrush Colors For fabric, textile, leather and all other porous surfaces. Createx 10 Color Fluorescent Set. Includes 2oz each: Fluorescent Violet, Fluorescent Raspberry, Fluorescent Blue, Fluorescent Green, Fluorescent Yellow, Fluorescent Magenta, Fluorescent Hot Pink, Fluorescent Red, Fluorescent Orange, Fluorescent Sunburst, Cleaner. Made with light-fast pigments, durable resins and quality ingredients. Createx works on fabric, wood, leather, canvass, plastics, aluminum, metals, ceramic, clay, poster board, brick, plaster, latex, glass and more. Cures to a soft-hand feel when used on textiles. Intended for application with large airbrush tip-sizes (0.5mm) operated at high PSI settings (45+). Colors are water-based, non-toxic and tested to meet ASTM D-4236 standards. Neon colors which emit a glow. Work best over a white base color such Opaque White. Fluorescent colors are NOT lightfast. The color's fluorescence is due to the pigment being in a rapid state of decay. Fluorescent colors are not intended for permanent finishes. Createx Airbrush Colors are the number one, most widely used and trusted professional airbrush paint in the world. Made with light-fast pigments, durable resins and quality ingredients, Createx works on fabric, wood, leather, canvass, plastics, aluminum, metals, ceramic, clay, poster board, brick, plaster, latex, glass and more. Colors are water-based, non-toxic and meet ASTM D-4236 standards. Colors lines include Opaque, Transparent, Fluorescent, Pearlized and Iridescent Colors. Createx Airbrush Colors are designed for permanent results with a soft-hand feel on fabrics. Colors cure with the assistance of heat after drying. The use of heat to cure colors is one of the main differences between Createx Airbrush Colors and Wicked & Auto Air Colors which cure to a much stronger film with air drying alone (referred to as self-cross linking). Createx are made with exterior-grade (automotive) pigments allowing them to withstand prolonged exposure to direct, outdoor light without fading. For maximum permanence, a top-coat should be applied over the paint after curing. For smaller tip-sizes, lower PSI settings and fine-line detailed artwork, reduce with either Createx 5601 Transparent Base or Createx 5608 Illustration Base. For more application information, visit our website's technical pages. WICKED PEARLIZED & METALLIC COLORS. WICKED ADDITIVES, MEDIUMS & UV GLOW. We are an authorized dealer for all the product lines we sell. If a listing is for a particular item then that is what you will receive. If you do want to attempt to change an order or make an address change, it is best to call our customer service department immediately. Once you pay your order prints in our warehouse for fulfillment. If you have questions on how to do this, please message us first. INTERNATIONAL ORDERING: All of our electronic items are rated for US voltage 110V. It is the customer's responsibility for knowing the correct voltage requirement of their country. If you select this option at checkout, be advised that if package is lost, stolen, or damaged, no claims can be filed. UPS Ground is used within the lower 48 US States and Canada. We will always make your order right. Then send your item back to us with a copy of the original order. SPECIFIC ITEM EXCEPTIONS: PAINT & DVD's - If defective or damaged they will only be replaced. We must have picture documentation of damage emailed to us on all paint related items in order to authorize a replacement order or return authorization. This listing is currently undergoing maintenance, we apologise for any inconvenience caused. Sellers: Get your own map of past buyers. 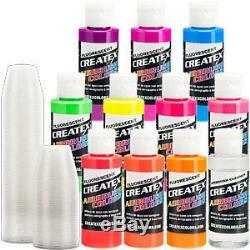 The item "10 Createx Fluorescent Colors Airbrush Paint Set Craft, Hobby, Art" is in sale since Tuesday, July 30, 2013. This item is in the category "Crafts\Art Supplies\Airbrushing". The seller is "tcpglobal" and is located in San Diego, California. This item can be shipped worldwide.